I found the CBDfx CBD capsules 25mg to be great for users that do not like the taste of an oil or the sweetness of a gummy. At this mid-range potency, CBDfx offers a convenient way to control and consume your daily dosage, with room to step up with more CBD as needed. If you don’t like the taste of oil or vape, CBD capsules could be perfect for you. CBDfx offers a 25mg capsule that will fit seamlessly into your vitamin routine. Let’s dive into the results from my 30-day CBDfx capsule test. CBDfx offers a wide range of products. Their roots are in vaping, but they’ve quickly branched out to create other high-quality CBD products, like capsules. CBDfx has been around since 2015 and is known for being a brand that is serious about its products’ quality as well as their customer service. 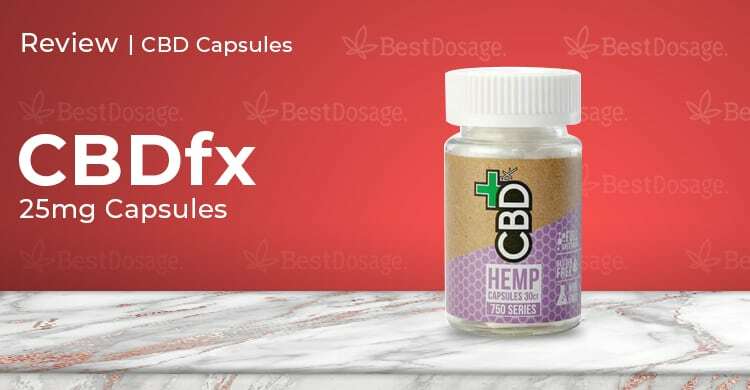 CBDfx CBD capsules are made from full spectrum, unfiltered and raw CBD oil. They are actually made by turning their mix into a powder, whereas other capsules are simply filled with liquid. The hemp is grown organically and each capsule offers a wide range of cannabinoids, amino acids, vitamins, and terpenes. The white box the capsule bottle is it gives a nice breakdown of ingredients, serving size, benefits and suggested uses. Once you open the box, you’ll see the bottle matches the box, you have all of the info listed on the label. The capsule itself is tasteless and easy to consume. Cracking open the bottle, the first thing we noticed was that the CBDfx CBD capsules have no smell. They also were easy to swallow and didn’t have a taste at all. Unlike some other capsules we’ve tried, this one didn’t leave a taste residue in your mouth. Along with the clear instructions on their label, this was definitely a positive first impression by a brand we expect that from. The capsules are 25mg and, while we suppose you could cut them up in theory, we wouldn’t recommend it. One capsule a day is a good place to start for those who already use CBD, and you can step up from there as needed. It might be a little much for a brand new CBD user, for which microdosing with CBDfx CBD gummy bears 5mg might be a better way to start until a “sweet spot” is found. CBDfx advises taking a capsule after you have eaten a full meal. Like most CBD capsules, this product takes about two hours to fully set in. But once it does you feel a nice body relief, nothing too strong. I did feel a stronger effect later during my 30-day test period. Around day seven I could feel a boost in the daily effects and it stayed at that level through the rest of the test run with the CBDfx CBD capsules. I experienced no withdrawal symptoms when I stopped taking it and had no negative side-effects at any point. These weren’t the strongest capsules, but they still did the job. At the very least, they’re a great alternative to some of the chemically constructed solutions for symptoms like anxiety, pain, and many others. If you’re looking for CBD capsules, you can feel confident picking up a bottle of these, and at a discount with the below coupon code.